The review below reflects normal prices and what we paid before I made some contacts in Cozumel. See my TripAdvisor page for more photos. 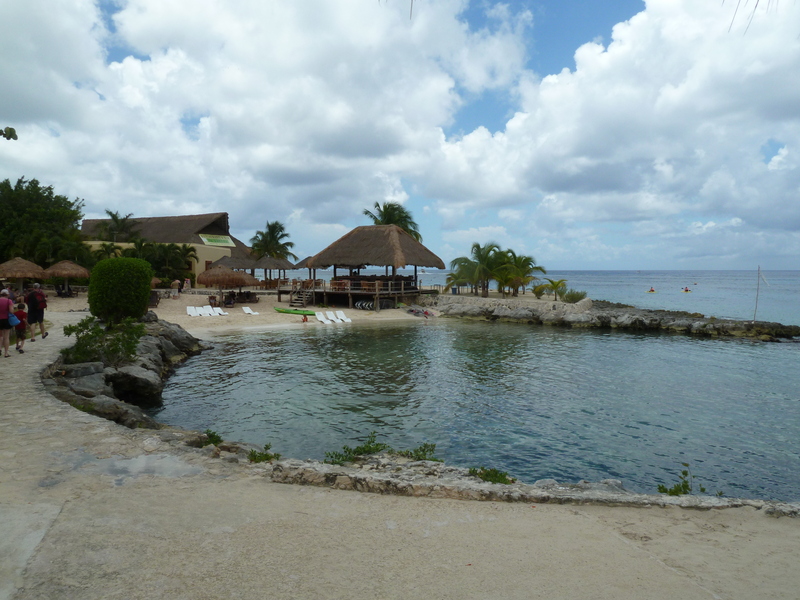 Cozumel Review: We went to Cozumel on a cruise and visited Chankanaab Park, this was the highlight of our vacation. We normally do a two tank drift dive in Cozumel because it has great diving and snorkeling, but this time we decided to do something different. We booked the push, pull and swim with the dolphins through our cruise ship, Royal Caribbean. 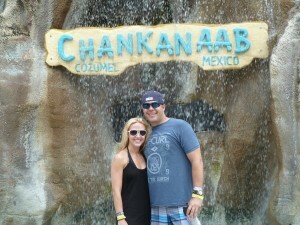 Chankanaab is a huge park with lots of other activities as well. The Park is 3 miles south from where most cruise ships dock. It is only 9 miles from downtown. The international pier is in between downtown and Chankanaab Park. A taxi costs $8 for 2 people one way from the international pier to downtown (about 6 miles) and they are pretty firm on this price. We started walking towards downtown from the pier and after 10 minutes we only paid $6 for two of us, but that is because we had been walking awhile. All prices that I am including are quoted in USD since the dollar is widely accepted in Mexico. 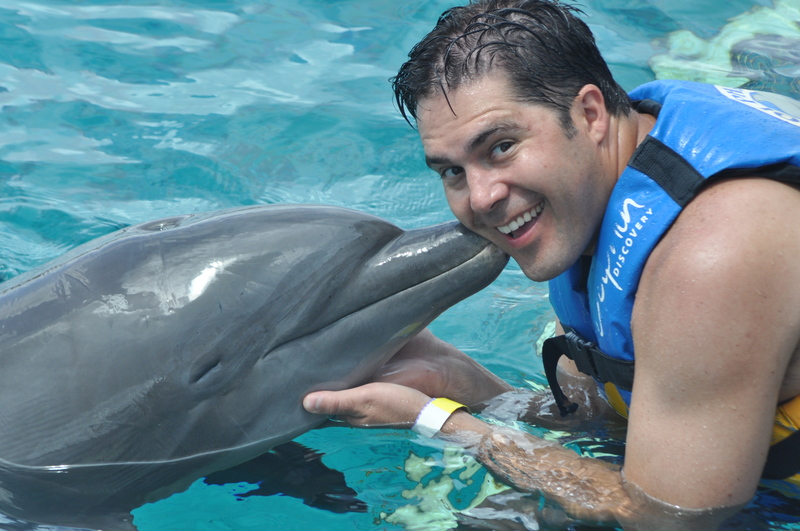 The dolphin encounter was worth the money and a lot of fun. We booked ours through Royal Caribbean, but as long as you don’t come in on Carnival Cruise you can take your own taxi and pay their prices at the gate. You can also pick up coupons off the pier or off their website. The advantage with booking through your cruise line is that if there is bad weather and they don’t end up porting there you can get a refund. Another advantage is that the taxi costs are all included. However, booking through your cruise line isn’t always the cheapest way to pay for excursions. With the dolphin push, pull and swim the dolphin pushes one of your feet while you are on a boogie board. Then he will turn on his belly and you hold onto his fins while he pulls you. You get to kiss him and he performs other tricks for you. You are not allowed to take your own pictures or have a friend do it. They will have a photographer there to capture all the moments. We also got to pet and interact with a Manatee (also known as a Dungong). They wouldn’t take our picture unless we paid extra. The photos are expensive. 1 picture is $35 and a CD of all the pictures is $139 for 2 people. We were there with 2 other family members so we paid $179 for a CD of the 4 of us and another $10 for a second copy of that CD. That saved us $44 per couple v. getting our own CDs. They also have a lot of other dolphin encounter packages, sea lion packages and manatee packages. We charged our pictures on our VISA card and they didn’t charge us an extra fee and the exchange rate was the actual exchange rate (unlike a lot of other shops around town). Once you are done with your encounter you are free to stay at the park until closing time because admission to the park is included in all encounter prices. You don’t have to buy those packages to get into the park because they have a separate admission price. Admission to the park is normally $21 pp and $14 for kids 12 and under. 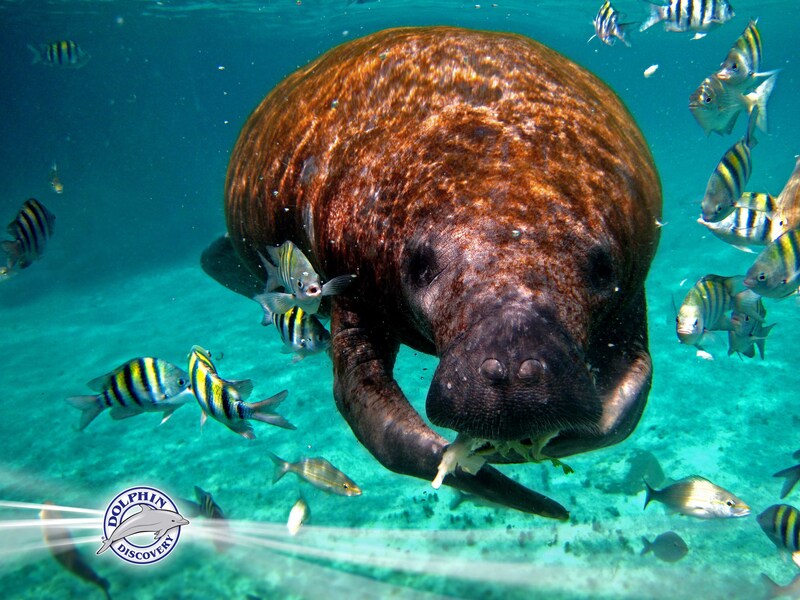 It includes free tours and shows including a guided snorkel tour, a sea lion show, a pre-Hispanic show, and a walking tour. The really nice white sand beach has hammocks and beach chairs to relax in, and tiki umbrellas for shade all free of charge. As you walk around you will see Ancient Mayan Ruins. 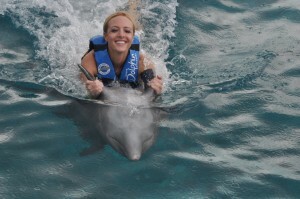 You are able to see the dolphins swimming and interacting with people. My favorite is the color of the ocean, bright turquoise blue against dark blue. There are lockers, restrooms, showers and sand wheelchairs all free of charge. They have a separate swimming tranquil lagoon, a fun swimming pool, a children’s playground, and a beach volleyball court. The beach didn’t feel overly crowded and lifeguards are on duty. The snorkeling is right off the shore; you don’t have to swim far at all. The depth goes to about 30-35 ft the further you swim out. At an extra charge they have snorkel gear rental for $15 per person or you can bring your own gear. I recommend a snorkel with a valve on top so when the waves come you don’t get a mouth full of salt water while snorkeling. The snorkeling here didn’t have very big waves, just little ones. Scuba diving costs only $55 per person and this includes all your gear and a guided tour. We weren’t aware they had snorkeling and diving and we left our gear, scuba certificate and dive camera on the cruise boat. We didn’t even have our scuba cards with us and they still let us dive. The diving was an easy 35 ft max for 45 minutes or until you pretty much run out of air. No safety stop is required here. It had a small current and we swam through some caves and coming out of the cave there was fresh water at the top mixing with the salt water and if you put your hand up it is really cold and you can see exactly where the fresh water was. We saw a huge parrot fish, lots of different kinds of schools of fish, lots of lobster, a huge crab, tube crabs, barracuda, a scorpion fish, huge eel, little sting rays and statues that they have down in the water. They had a photographer follow us around and we ended up buying the pictures for $25 which was down from $40. You can also purchase a snuba package for those of you not wanting to do the scuba diving but still want to go under water with a helmet on. 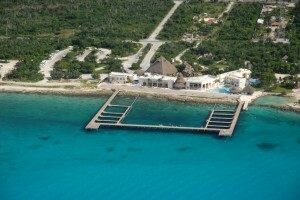 Or if you want to try scuba diving they will give you a crash course in it and this is a great spot to learn. My husband and I learned on the drift dive in Cozumel and we have been hooked ever since. If you are a die-hard scuba diver and have never dove on Cozumel’s drift dive from a boat, then I recommend that one first. On the drift dive you will see lots of bigger fish there, large clams, reef sharks, barracuda, sea pearls, turtles, a wall of blackness where the reef drops off. Pretty much everything you will see at this park, but a lot bigger and dramatic. With the drift of the current pushing you all one way, the boat picks you up on the other end so you never swim against this current and if you try to swim against the current you are pretty much staying in one place. The current can of course change its ferocity depending on the day. For an extra cost within the park they have restaurants and bars. We ate lunch near the dolphins and it only cost $25 for two of us and it was good authentic Mexican food with homemade tortillas. They also have a tequila tasting tour of 30 different flavors. I did not go on this tour, but I am pretty sure they said 30 different flavors. They also have a drug store, an ice-cream parlor, a boutique and shops, and a taxi service. 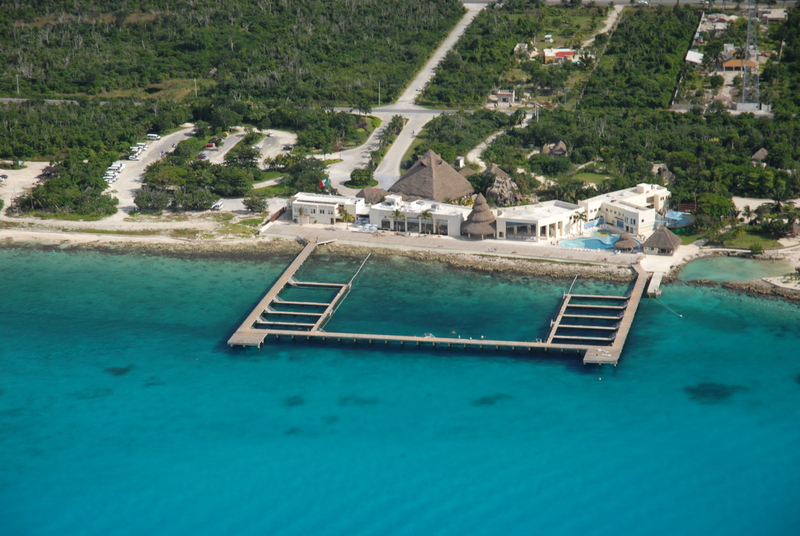 Cozumel Tips: Your US dollar will stretch further here. Silver is what Mexico is known for and it is cheaper to buy it here than in the US. Make sure it has the Mexican stamp .925 to know if it is solid authentic silver; some places try to sell fake silver. You can usually tell by looking at it, but if you carry a magnet with you and it sticks to the magnet then it is not real sterling silver. There is a huge shopping mall right next to the boat dock downtown, but most cruises port at a boat dock further south, about 6 miles from downtown. They have a lot of shopping at the international pier which is where most of the cruise boats dock. The shopping is cheaper downtown, however after you pay for a taxi, you may be even or have paid more than if you were to stay around the international pier. We were shopping downtown for some silver jewelry and went to use an ATM machine. It wanted to charge us $20 to get cash out which is really high, so instead we paid the merchant $9 USD to charge it to our Visa card. If you are going to be spending a lot of money it is worth it to exchange into pesos assuming you get a fair rate of exchange. Read my tips on exchange rates for more information. When tipping they don’t care if you tip in US or pesos. Everywhere takes both so they don’t usually have to exchange it. Just don’t tip in US coins since they are useless for them. Bills only and make sure they aren’t old, worn, torn or faded. Or of course pesos work as well. Tip the normal % like you would in the US for tour guides, taxis and restaurants.